From little girls to pre-teens? I'm on to you, sister! I also wanted to get Gigi a chair that is her own size. So when I came across this gem at a garage sale for $5, I snatched it up. I looked at it and thought "It can't be that much work." I had read on another website that Easy-Off Oven-Cleaner worked well for removing paint. I happened to have some handy. So I sprayed it down and let it sit for 5 minutes. Wow, the paint did come off pretty easily, too! 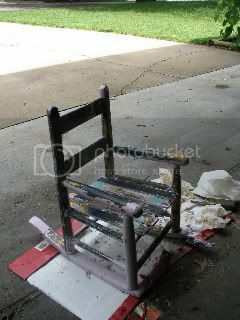 However, I didn't count on how many layers of paint were on this chair! These are the colors I remember seeing. Lavender, Navy blue, yellow, aqua, red, and white. Whew! Three rounds of stripping. 2 coats of primer and then 2 coats of glossy white paint. The finished product - and Gigi loves it! Wow, it looks great - fabulous job! Easy Off, who'da thought? Thanks for the tip. 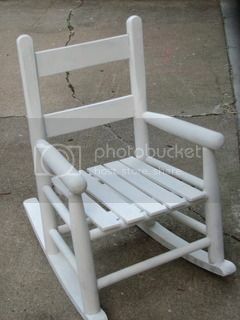 Nice blog, here is some more information on Rocking Chairs. It's amazing what a little work and a can of spary paint can do. Looks great!! Thanks for the Oven Cleaner tip. I had no idea! So awesome! 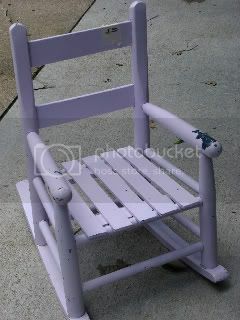 I totally need to redo my rocking chair - it is 13 years old, but I won't get rid of it. Hubby snarls but oh well. I still use it with my 1 year old so I have the say on it staying. 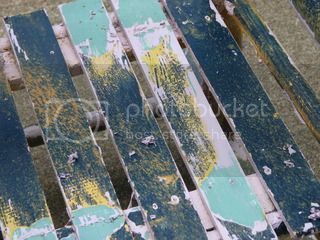 :) So I need to repaint it asap so it can be "pretty" anywhere and I don't have to hide it in a corner. Very cool rehab... love the oven cleaner tip! Wpw! I went through that with a cupboard one time! I love doing this too. fun and rewarding.